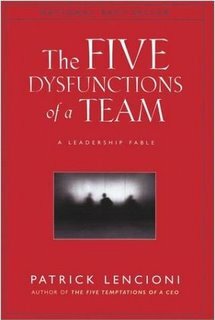 Five Dysfunctions provides a number of interesting lessons and insights into getting a high performance team started. Rick is available to lead a small team discussion - excellent for small business teams looking to energize the start of an innovative team. Receive a free pdf of Rick's complete analysis - put Five Dysfunctions in the subject line. Five Dysfunctions is written as a leadership fable in the first section and then presents the fundamentals in the second section. This works very well as it gives the reader a great perspective on the utilization of the tools presented by the author in the second part of the book. teamwork - remains the ultimate competitive advantage, both because it is so powerful and so rare - if you get all the people in the organization rowing in the same direction you could dominate any industry, in any market, against any competition at any time - however, teams are inherently dysfunctional because they are made up of imperfect human beings - success comes only for those groups that overcome the human behavioral tendencies that corrupt teams and breed dysfunctional politics within them. 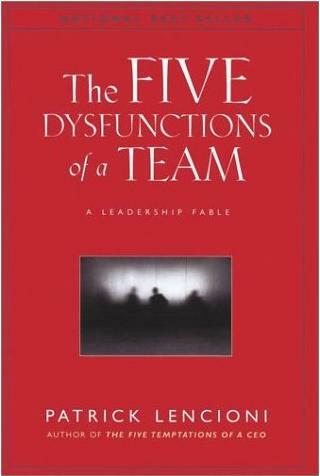 Rick has further analysis on each of the five dysfunctions and the positive model for team building. Receive a free pdf of Rick's complete analysis - put Five Dysfunctions in the subject line.